Why doesn't the Township mow the grass along the roadway right of ways? All the property owners abutting an roadway are required to maintain up to the edge of the street. Why does the Township push the snow all the way back to the curb when snowblowing? 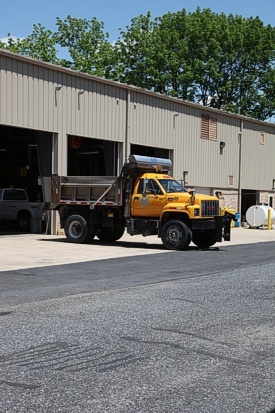 To keep the roadway as wide as possible for subsequent snow storms during the winter months. What is the Cameron Tract Yard Waste Site on Eberhart Road? The site on Eberhart Road can be used by Township residents that are own and occupy their home to recycle larger amounts of yard waste from their property that are over the limits for yard waste curbside pickup. The site is NOT for cut green grass drop-off that is collected curbside the day after your refuse, recycling and yard waste pick up day. After a storm a street tree in front of my home came down and lost a huge branch. When is the Township going to clean it up and take it away? Street/Shade trees is the responsibility of the property owner in Whitehall Township. It is your responsibility to remove or hire a licensed contractor to remove the debris per Article XVII of the Township code relating to the Shade Tree Committee. I received a letter from the Public Works Department informing me that I need to prune the street tree in front of my home. Its not my tree. Street/Shade trees, as well as all other trees on or over your property are the responsibility of the property owner in Whitehall Township. It is your responsibility to prune the street tree and maintain a height in underneath so that the school buses, garbage trucks and Township plows have clearance to maneuver per Article XVII of the Township code relating to the Shade Tree Committee. As well, it is the responsibility to maintain all trees on or over your property. Therefore, if you have a branch overhanging the neighbor's property- if you don't want them to cut it first- you should take care of it!